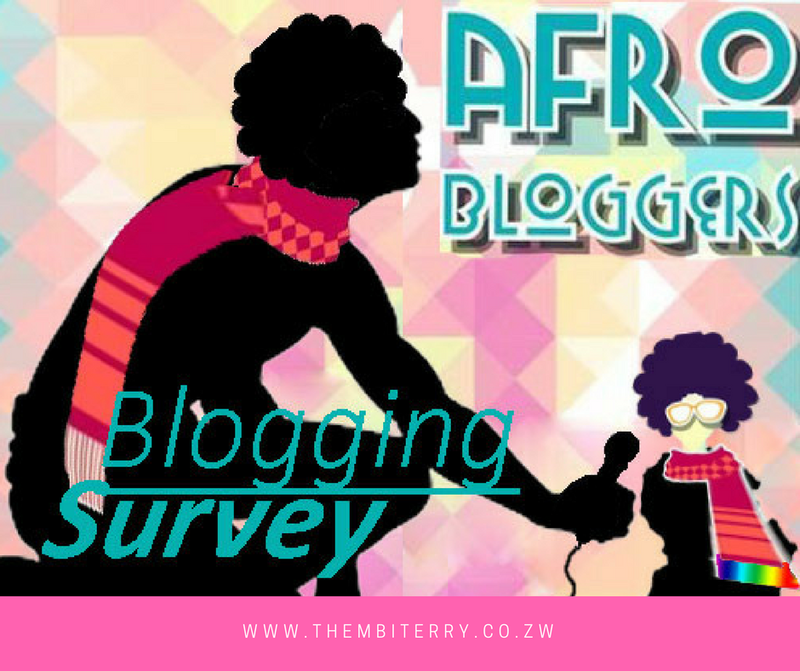 Saw this bloggers’ survey on Afrobloggers and I have been meaning to get around to it and you know how procrastination gets. I finally took the time and completed the survey. Please find the responses below. 1. How long have you been running your current blog(s) for? My blog, Thembi Terry, has run for four years now. I started it in July 2013 and it revamps every year. 2. What is the purpose of your blog? The primary purpose of my blog is edutainment. I read somewhere once that you can’t tell people what to think but you can tell them what to think about. So, I like to blog about life experiences but in a fun and quirky way. Some of the issues are serious but the point is to get people thinking. 3. How many blogs do you follow? I follow a wide plethora of blogs. I get exposed to a lot of bloggers on the various blogging communities that I am in on social media. I am very ease to please. If you have a fresh perspective, I quickly become an avid follower. I learnt very early on in blogging that showing an interest in other people’s blog breeds reciprocation. 4. How frequently do you post on your blog and how do you share your posts, to reach an audience? Previously, I’d post twice a week but now it’s once a week because of my busy schedule. I just can’t seem to catch a break. I use social media platforms such as Facebook, Twitter, Google+, WhatsApp, LinkedIn and Instagram to share my blog posts and reach my audience. 5. Do you have any writing rituals? A particular time you write, music you listen to, quirky habits to get in the zone? It’s hard for me to get in the zone when I am exhausted. I need to be thoroughly rested and pressure free to get the blogs out. At one sitting, I can churn out like 7-10 posts. As inspiration hits, I jot down the possible headline for the blog and then flesh it out like on Sundays. I don’t have a special time set aside for blogging but I do have a schedule of what goes up and when. New posts are due Mondays and Wednesdays. Mondays are personal posts and Wednesdays are business posts. I follow a strict order of the way things are done. 7. How often do you check on your blog? Every two days I check in to respond to comments and to check up on my stats. I also like to check on Google what the Zimbabwean Bloggers are up to. I also run image searches to see where I rank on Google. My ideas start on the phone and are completed on the laptop. Ideas can be noted down on my phone and posts may be drafted on my phone but the rest I like to do on the laptop. I design the blog titles online which I cannot do on a phone. 9. Do you take the time to read and discover new blogs? How much time do you spend reading other blogs? I follow blogs from the Afrobloggers blog. It’s hard to tell how much time I spend reading other blogs because once I am hooked I’ll just keep scrolling to the next one. The internet is an alluring mistress. Thursdays are usually set aside to other blogs and industry research. I am blessed to have WiFi at home and at work. For times while I am in transit I have Netone’s OneFusion. I am currently on Fusion10 which is more than enough for me to conduct my blogging affairs without hassle. Bonus Question: If your blog were a movie which one would it be?